For the SQL statement a call to exec one of the stored procedures created earlier is used and 40 threads because 20 physical CPU cores and hyper threading enabled results in 40 logical processors being presented to SQL Server. 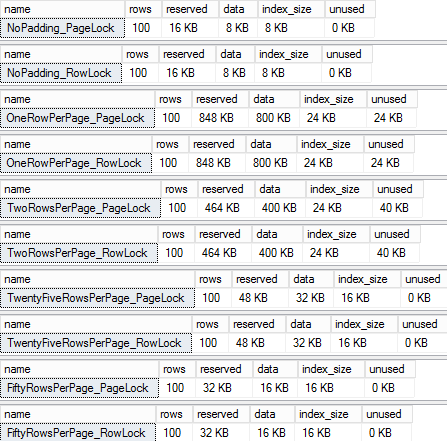 For index seek heavy workloads in which only a handful of rows and being selected or inserted/deleted/merged/updated per query, as the number of rows per page increases, the more beneficial it becomes to use row locking instead of coarser grained page locks. 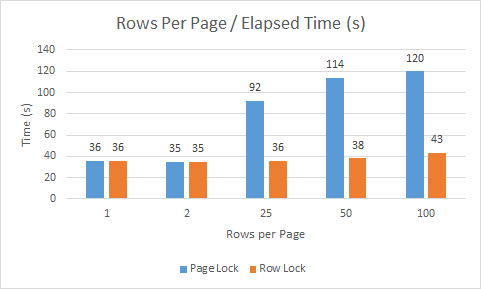 I strongly suspect that PAGELATCH_SH waits are responsible for the increase in elapsed time for the tests using row level locking as the row density per page increases, which is something I will blog about another time. There are certain OLAP scenarios particularly with bulk loading where coarser grained locks result in better performance, this will be covered in a future blog post.